Aside from cookbooks, travel and guide books are what fill my shelves and every year, I add a few more to my growing collection. These are my favorite bedtime reading and are an entertaining form of vicarious travel. In preparation for an upcoming trip to Paris, I’ve started researching on the internet for new places to try out. 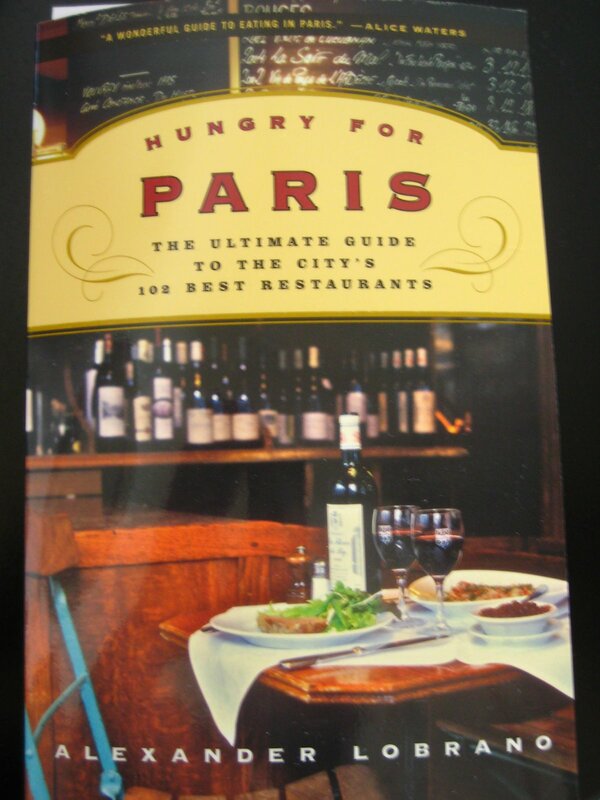 To help my search, I also ordered Hungry for Paris from Alexander Lobrano (Gourmet magazines’ European correspondent) because I thought it would give me a more detailed review of the restaurants that were already on my list. It was a surprise to read the book and discover so many under-the-radar (not necessarily new but just not often written about) restaurants out of the 102 listed in the book. I was also pleased that quite a few of them were in the Left Bank (5th, 6th, and 7th arrondissements) and within walking distance of the hotel we usually stay at. Since I’m meeting my mom in Paris for a few days before coming back with her to Marbella, we’ll have almost a week to explore the city together. The last time we were in Paris together was for two days in October 2007. On that trip, she was too jetlagged from her flight and I was too tired from walking that we hardly went out. This time, I’m hoping we can try a couple of neo-bistros and some old favorites as well. As I don’t want to spoil the surprise of where we’ll be going, watch out for my Paris posts at the end of May. I’ll have Alexander Lobrano to thank for the “new” places he’s pointed out that are worthy of a meal. His book has definitely made me “hungry for Paris” all over again. Thanks for the book recommendation! I’ll try and find it on Amazon. Have you read “Paris to the Moon” – it’s another one of those I LOVE PARIS books. stumbled across your blog and love reading it. one book that really got me in the mood for france (as well as salivating) was Trail of Crumbs. You should check it out….it’s a bit of a light, guilty pleasure, like a celeb magazine.